Bitcasa offers the best value than with it comes to sheer storage space, but you'll have to accept less functionality in return. There is no shortage of places to store your stuff online. But when startup Bitcasa promised "infinite" storage space for $100 a year, more than a few heads turned. Google (GOOG) Drive, Dropbox, Apple (AAPL) iCloud, Microsoft (MSFT) SkyDrive, Amazon (AMZN) and other cloud storage services have various limits on the total storage capacity they allow as well as the maximum size for any file you upload. Big digital lockers can get expensive very quickly. The reason Bitcasa can offer unlimited storage to customers for $100 a year and not go out of business is because of the unique way it stores files: Bitcasa only keeps one instance of each file, no matter how many people upload it to the company's servers. So if you go to store "Hey Jude" by the Beatles, and that song already exists on Bitcasa's servers, Bitcasa will just use the file it already has on hand. It can even store files more efficiently than that: Bitcasa breaks up your files into a bunch of little data blocks, so if any piece of your file matches a piece of someone else's file, Bitcasa only needs to store one version of that file chunk. In a nutshell, that cuts down on the amount of bandwidth and storage space Bitcasa needs, allowing the company to offer much more storage at little extra expense. For the most part, Bitcasa's claims hold up. It does what it promises. No file is too large, and no drive is too expansive. Want to upload a 10 terabyte file? No problem. 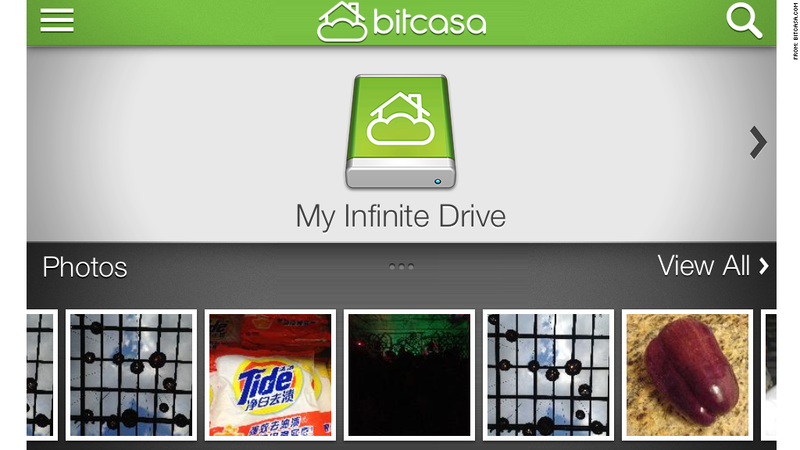 You can even mirror an entire hard drive on Bitcasa. Related story: To the cloud! Wait, the what? Much like any other cloud storage service, you can upload individual files using a Web app, or mirror entire folders or drives using the desktop extension. Upload speeds vary, but for a 150 megabyte file, Bitcasa's upload process took roughly the same amount of time as Dropbox's (about two minutes). But in nearly every other aspect, the service is currently lacking. Unlike Dropbox, there are no options for maintaining a shared folder among friends, and you can't view or share links you've sent or received from within the app. Compared to other services, there are fewer file types that you can view or open in a browser window. And though Bitcasa is working to expand its feature set, you can't move or organize existing files using the Web interface. If Bitcasa ever became the cloud storage front runner, uploading MP3s and TV shows could be a quick and simple as the server scanning and matching your file to what's already on its servers. But since the service just rolled out of beta in February, there are just fewer people using Bitcasa -- which means you'll be uploading a LOT on your own. Privacy advocates have also criticized Bitcasa for its lofty promises it makes about security. It's an unlikely scenario, and Bitcasa's current terms of service assert that it will never hand your data over to anyone, but it is something to consider. The promise of unlimited cloud storage is something that is not yet a necessity for the masses -- how much storage do you really need? If your answer is "as much as I can possibly get," Bitcasa is your best bet. For everyone else who values robust features over sheer storage capacity, stick to Google Drive or Dropbox.